Mission San Luis Rey, located in Oceanside, was the 18th mission built in California.? Established in 1798, the mission is now operated by the Franciscan Friars of California and is a parish church.? There is a museum, a gift shop and a retreat center on the grounds as well as an active cemetery and gardens. With more than 5,800 acres, this park is the largest natural urban park in the United States. Hiking and biking trails cover the terrain that varies from Cowles Mountain, the highest point in San Diego County, to lakes and streams. The park also encompasses one of the county's most historical sites, Padre Dam, which was California's first aqueduct project built by native Indians for the Franciscan Fathers. In 1995, the Mission Trails Interpretive Center opened for visitors, highlighting the park's resources and describing the history of the area. This outdoor venue has been a draw for the community for the past 30 years, and has hosted numerous concerts, musicals and plays. It seats 899 in permanent seats and can accommodate an additional 1,200 on the manicured lawn. This wide, sandy beach offers swimming, surfing and fishing. Facilities include volleyball and tennis courts, recreational equipment rentals and a snack bar. Mount Helix was named after a snail in the area, the Helix aspersa. The location now includes a wooden cross, erected in 1917 for an Easter service and an amphitheater. The cross area is now owned by the San Diego Historical Society and the amphitheater, besides providing an incredible 360-degree view of San Diego County, is a venue for weddings and community theater offerings. Naval Base Coronado is comprised of both Naval Air Station North Island and Naval Amphibious Base Coronado. It is part of Navy Region Southwest and a field activity of Commander, U.S. Pacific Fleet. Adjacent to Anza-Borrego Desert State Park, this area has over 42,000 acres of desert terrain, from below sea level to 400 foot elevations. It is a motorcycle, four-wheel drive, all-terrain vehicle, and dune buggy use area. 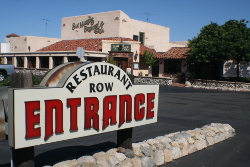 A popular destination in the community on San Marcos Boulevard, Restaurant Row now has 17 restaurants. Eateries range from institutions such as Old California Mining Co. Steakhouse & Saloon, Cocina Del Charro and Fish House Vera Cruz, along with Sublime Alehouse, Katsu Sushi & Teppan Grill and Fratelli’s Italian Kitchen. Named and modeled after Shakespeare's own Globe Theatre in London, the Old Globe theater was built in Balboa Park for the California Pacific International Expo of 1935. A group of citizens saved the theater from demolition after the Fair, raising $10,000 to do it. The theater's luck didn't last forever, though -- an arsonist burned down the theater in early 1978. The rest of the theater complex was spared, and the rebuilding campaign raised more than $6.5 million. The new theater opened in 1982 and consists of the Old Globe Theatre, the Cassius Carter Centre Stage and the Lowell Davies Festival Theatre.